Encryption Software for data stored on external drives or portable drives such as USB, Flash Drive, Thumb Drive, Memory Stick etc. External Drive or Removable Devices such as USB, flash drives, memory sticks, thumb drives, pen drives are portable. These devices with large memory space and minuscule in size which makes them extremely convenient, easy to keep and carry with you wherever you go. But unfortunately it also makes them easy to lose, mislay in the hustle of everyday life. Losing a USB flash drive or any portable device is no big loss but losing your confidential data or files and folders can be disastrous. 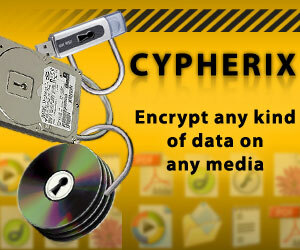 Cryptainer Encryption prevents data leakage from theft and lost of USB drive or any portable drive. Cryptainer Encryption Software includes a 'Mobile' feature, which allows to password protect all media (including, USB, Flash Drive, CD/DVD etc). It creates encrypted disk drives within which all sensitive information can be stored. You can protect USB, your files or folders against unauthorized access by encrypting your confidential data stored on external drives or removable drives. Password Protect USB to protect your secret data, files and folders against unwanted access. Any kind of data can be stored into this encrypted drive, rendering it totally inaccessible by anyone but you. Thus, even if your USB drive or external drive is stolen or lost, no one can access your data. Cryptainer Mobile feature allows to create a 'stand-alone' or a 'portable' install of encryption software on a Removable Drive, USB Flash Drive, Memory Stick etc. This encryption software can be run directly from the device without having to be installed on the host computer. No matter where you are, you can easily carry your important data (stored within an encrypted drive) with you. Creates unlimited number of encrypted drives on your local hard disk or external drive such as USB flash drive that appear as removable drives in Windows. It functions like any other regular drive on your computer. USB Password Protect, Data Encryption, file and folder encryption by simply creating encrypted disk drives, where you can store your sensitive data. Just drag and drop to secure any file, folder or any type of data in a safe password protected drive. Portable Data Protection for your USB, flash drive, thumb drive, pen drive, memory stick etc. This program creates 'portable' install of Encryption Software that can be used to encrypt files and folders on your USB Flash drive, removable drive. Cryptainer Encryption Software is completely portable, it can be installed and run directly from a USB flash drive. Tabbed Windows Interface feature allows to Mount, Unmount and work simultaneously with multiple encrypted drives (volumes) at once, simply and easily. 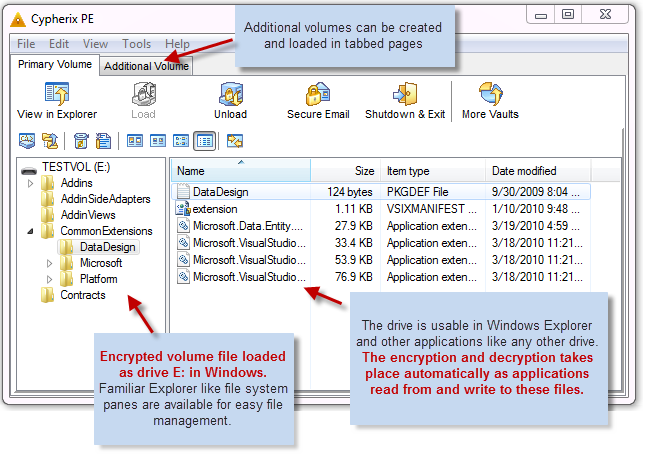 Each new volume (encrypted drive) appears as a new tab window and can be accessed in one simple click. This feature allows multiple encrypted disk drives to be loaded within a single window. You can access, mount and work simultaneously with your multiple encrypted drives. Unlimited number of encrypted volumes (drives) can be created, as large as 10,240 GB each with Cryptainer disk encryption software. You can password protect an infinite amount of data, from 1 MB to 10,240 GB (10 Terabytes) of data in dedicated areas on your local hard disk (s), external drives or portable storage devices. Password Protect USB flash drive, memory stick, thumb drive, pen drive any removable drive with Cryptainer encryption software. Protected data can only be viewed, accessed, browsed or modified by the user who has the password to open it. At other times, the files are totally locked and hidden and totally inaccessible. Simple, Secure, Easy to use on-the-fly disk encryption making sure that absolutely anyone can use it effectively. What you get is foolproof, hassle-free, unbreakable computer security with just a single password. Fully compatible with all 32-bit and 64-bit versions of Windows including Windows 8.1 and Windows 10. Do you have sensitive documents on usb drive or portable device and care about someone accesses your data by stealth? Worrying about storing sensitive information on backup media is a thing of the past. Taking encrypted backups of Cryptainer volumes is a one step process, as easy as "Drag and Drop". Cryptainer can create encrypted volume files on removable drive. This allows for the flexibility to store and port data on removable media like USB, Flash Drive, Memory Srick, CD/DVD, Zip disks, tape drives, etc. Take backups using standard backup software/hardware, ensuring safety and integrity of data. Easy to use, User-friendly interface to minimize the learning curve, and make the product easy to use. It does not require any technical skills. Standard Windows functions such as cut, copy, paste, new file / folder creation, etc. can be used within the encrypted drive. Secure Email module allows for the creation of self extracting encrypted files. The recipient need not have Cryptainer installed to decrypt the files, all that is required is the password. This allows for a totally secure communication system that makes use of existing generic e-mail clients on a public network, yet allows for totally secure data transfer. Fully compatible with all 32-bit as well as 64-bit versions of Windows (Windows XP, Windows Vista, Windows 7, Windows 8, Windows 10) and works with all known file types. Cryptainer can be installed directly on a USB / removable drive as a "stand alone" install. One can carry this installation of Cryptainer Encryption Software('Cryptainer Mobile') to different machines without having to install Cryptainer on the host machine. You can encrypt your files and folders and ensure total privacy with Cryptainer encryption software. Simply drag and drop the files and folders you want to protect and voilà! your files are encrypted. With Cryptainer you can hide the very existence of your confidential files and folders. Additionally, Cryptainer allows you to send encrypted email files. The recipient need not have a copy of Cryptainer installed to decrypt the files.